Hi, I am working in your example,It works perfectly in Firefox but in IE does not insert any item in the list, Do you know what is the problem? ya it doesn’t work with ie,i have tried to put option tag and call the function i get all of them in one line. Bro change the file name “counties2” with “counties”. Hi, thanks for the script. I’ve found that the State drop down doesn’t reset when going from a large list i.e. UK to a small list, the remainder of the options still stay there. I have added in “option_str.length=0;” to the print_state function to reset the list. It saved my time. Very good script. Countries2.zip eliminates all the bugs. Row content is correct. It contains all the states of India. Its perfect. I’m from India. I have a problem with this script: If someone accidentally selects the WRONG country, and then selects the right one, under the list of states etc, the states from the wrongly selected country will show below those from the current country. Is there a way to flush the state drop-down when another country is selected to avoid this happening? Just seen Julian’s comments above and used the ‘fix’ – that works perfectly. 99% of the time a member won’t be making a country change – more likely a state/province/county change. into the select box itself, but although the current state shows, the Country select box shows the ‘Select Country’ option. Bits got stripped out of my message. If you can help, please eMail me and I will give the full code. Hi, Would it be possible for you to let us know where you got the data from ? I would like to populate some SQL tables with this data but it might be easier using the original source. Hi, first off thanks for the script it is perfect for location entries. I am having the same issue as Glen in that when a user goes to their edit profile page I want the current country and state/province they have in the db to be selected. Is there a way to use an if statement within this code so that when the option fields are being generated if the current option equals what is in the database, that option will be selected. Very simple and cool your project. Thank you, help me a lot. I put default select in your code. Feel free to use on your main code. after selecting a country such as USA then selecting another such as Australia I noticed the region/state option would append in FF. please , provide me code for country , state and city . Does anyone know where exactly in print_state’s function to put in “option_str.length=0;” ? I am having the same problem as Glen. But I have no idea where to slot that code in. Would appreciate if someone could answer this? Thanks!! Realized i hd been using the outdated version of this thing didnt know there are newer files in the folders @ sourceforge. Anyone know how to incorporate this into a wordpress site? A directory that is like craigslist, so same topics but in different cities, countries. People would search or add content only in their specific city or country. ie ) Two locations: Los Angeles and New York. Type of places: clubs, bars, restaurant. Person can choose to search based on city and type of place. Terrific submit man. For those who are enthusiastic about Cura de slabire evening me. Very good script, but I need country/state data list on XML spreadsheet (column A : country and column B : related state) I’m appreciated if someone can help me put them on XML file. Hello all! I like this forum, i organize many inviting people on this forum.!!! hi i tried to use it with jquery.jqtransform.js it doesn’t work. As a test I selected Vietnam first, then selected a city in the list. I then selected USA. When you look in the list of cities it now shows both USA cities and part of the Vietnam cities in the list. I tried this with both Firefox (ver 8) and Chrome (ver 16). Besides that it is a good script and saved me a lot of coding. So far i facing 1 problem, I cannot get the selected value from the list. I modified Jan Souza’s code further by adding default State along with his default Country. Here’s the changes to the last two functions. But if you can provide cities then please inform me as soon as possible, i need them. but i face same problem that melvin have. country, region, county and city. It is good try to make the things fast. If you try this from Ajax + jquery this would be more batter. There are some corns it this approach. Number one all values of countries and states make the large HTML page. This will slow down the page load. Number if you dont want to grab page information from any others then it is hard to protect. I am sure if you use jquery approach then performance will not effect any more. It is true this approach is fast while changing the dropdown value. but same this slows the page load. I used the countries and state script you provided…Thanks for that..please help me out in this…Thanks in Advance…. This works in IE9, no other browsers tested. Then, when you want to print a label, just use the first two letters for the state. I don’t know how it works in other countries, but 2-digit states work best in the USA. Can you send the code to generate country code like for India == 91 like this please i need it for my blog. I have the exact same code you posted. Any ideas why I’m getting this error. Kind just tested on a HTML page and it is giving the same error message when debugging. I made some changes to it and now it is partially working. The list of countries displays but the list of states is not. How can i include this in Contact Form 7 for WordPress?? Hi Nice code . Please provide city code too. Thank you for your valuable script, and the great efforts in the research of the countries. You are king! For those of you who are experiencing the state populating with a previous country’s state list use this code in the countries2.js to fix it. Hi, i hv used ur code but it doesn’t display the country list,state ?? I followed your instructions. can you please explain the function print_country and print_state working. i did not get the point when i selected the country how the print_state function function works, what are the arguments doing in both the function? and why we need x and i variable?.what actually the onchange event doing?,what is the use of .options property ?? i want to change the script little bit but not able to undestand it properly. plz help me asap. I want add another dependent drop down menu after the “state” and I tried to add the following code.But, is not working ,a can anyone help? *make sure there isn’t a space between the “<" and "select" / "script". Thanks for the great tutorial, I’ve found it extremely helpful! Since if I wanted to choose Afghanistan I have to select a different country and then go back to Afghanistan in order for the City/District/State to display. Why didn’t you use the country and state codes in the dropdownlists values? It is repeated as the text and value for each dropdown item. Neat indeed …. would there be anyway to develop a way of using a google map address lookup (jquery map) that automatically uses the lat/long position of the person signing up and then “completing” the data by adding a country code and state info utilising your method above? B this is great but I’m new to JS and was wondering where I designate the default Country and State. The default country and state parameters are sent to the print_country function of countries.js which is called after you create the select boxes. I am using PHP to pull the default country and state out of a database if it exists, and use it as my defaults. You could simply pass “USA”, “California” if you wanted. The function you call is print_country. If you pass it defaults, those will appear in the select menu. If you only pass it the ID Attribute (“state” and “country” are the ID attribute of my 2 select boxes) It gracefully displays the standard select box. B, I tried your code and I wasn’t able to get the system working. Even when I only input print_country(“country”) I don’t get anything in the drop down menus. Is there something else I need to do to the code beyond removing the code for the functions that was already there and pasting in your code? Is there anything I need to do when writing the new code into my HTML page? Are you including the js file in the head of your html? is the id of your country select box “country”? did you call the function after your html code for the select box? The id of my country is country and I call the script after the select boxes. Sorry just realized the code didn’t paste well. Ok here is the code. CHECK YOUR QUOTES IN YOUR JS FILE…. Using lQuery chosen plugin the script don’t work. Any idea? wht's the use of this line . 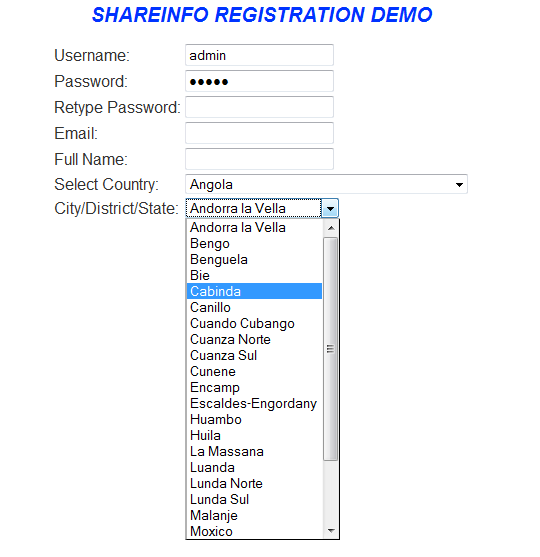 ..
hai,am using this code its working good but i have an issue am using state countries drop downs 2 times in the same form, for first drop downs its working but second on showing empty drop downs, pls help me to solve this………. hai,Thanx 4r reply……. and already i solve this issue…………. Hi This code working very without any issue. Thanks a lot for this script ! I wonder if is possible to add a link to some cities, after choose a city, people go to another page. – do you have instruction how to add this script to a wordpress page ? Do you know how you could have two country and state drop downs on one page? When I put a second one, the countries do not show up. Really nice work. I applied this script to my website. I am now trying to modify the function so that when Canada is selected it changes the “State:” label to “Province:” and the message should also change to “Select a State” or “Select a Province”. Shouldn’t be too complicated. Will post if I have a result. Thank you. Hi, I am using your project. Very useful. Though, it doesn’t handle the case where you select a country twice, it will add up the regions from both countries in the Region dropdownlist. but if i supposed to show data from db how can i use this. if i want to edit the profile of user then in the country field it shows some number how could i get the country name rather then number…. I use this script for classipress and it works perfect untill one point. Country and state are not stored in the database. How can I update mysql with choosen country and state? what should be ct equal to in order to validate? ?Sorry as am a beginner am asking this question. Can you configure the script so that values returns the ISO code of countries, i.e. two alphabets in values! Well also if you can give option to developer to choose between type of value returned from selection, it would be really appreciable. I want drop down list ofor cities of india? can anyone help me? Very nice code. It works perfect. Thanks. My question is how to pull out states from a db and not from js itself. It gives the country drop down and state drop down of India. When you want your country name just change the country name which one you want to show on page load. It will automatically load the states of the country you mentioned. When you want only country drop down, you just make blank the state drop down id. Dear Shafi ul Azam, thumbs up for your work. But I’ve required a form with three different drop downs i.e. country –> State/Province –> City. Can you please suggest me something helpful in this regard?? Thanks for sharing your script with everyone. Is it possible to include an additional info on the region section like image and hyperlink stuff? Next image/link appears with region list populated > Shanghai. God damnit!! Finally I gotten it sorted out, the Default “Country” and “State” issue. Do not name your js file as ‘countries3-1.js’ IF you are using Chrome! It will not work with the HYPHEN!!! Hyphen in the name works with Firefox, but not Chrome!! Renaming it to ‘countries31.js works beautifully! !